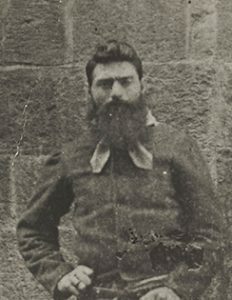 Ned Kelly was born at Beveridge in December 1854. From an early age, Ned engaged in criminal activity and at the age of fifteen joined bushranger Harry Power in highway robbery. Ned was a clever criminal and only went to gaol twice, once for assault and once for receiving a stolen horse. Ned confessed to committing many crimes, but he was able to escape punishment for them. After his capture at Glenrowan, Ned claimed he shot the policemen in self-defence, but the evidence clearly shows it was an ambush and the police were attacked with little warning. The Euroa and Jerilderie bank robberies netted the Kelly Gang thousands of pounds and captured the imagination of the public. At Glenrowan, Ned dressed in his signature armour confronted the police in a last stand fight. He was captured, tried and convicted of the murder of Constable Lonigan and sentenced to be hanged. Ned died on the gallows at the Melbourne Gaol 10 o’clock in the morning on 11th of November 1880. He was twenty-six years old and had been an outlaw for just over two years.